On Sunday May 11th, the Firestorm team released Firestorm 4.6.5.40833. Given this release comes just two months after the 4.6.1 release, it does not have a huge raft of new shiny. What it does offer is a nice package of new features and updates, together with a fair few bug fixes from both the Lab and the Firestorm team. As always, the complete list of changes, together with attributions, can be found in the release notes, and I refer readers to that document for specifics on all contributors, FIRE JIRA links, etc. The following is intended as an overview of some of the more major / interesting changes, updates and fixes to be found in the release. Installation: as always, a completely clean install of the viewer is recommended. Fix for a suspected thread race crasher in the FmodEx library. The recent LL viewer-side interest list updates are not a part of the Firestorm 4.6.5 release. As noted elsewhere in this blog, the interest list code is a non-trivial merge due to the extent of changes included alongside of the core interest list updates. It’ll therefore take a little longer for this work to appear in Firestorm. Firestorm 4.6.5 see the Build options in Preferences revised, with two Build sub-tabs (Build 1 and Build 2) under Preferences > Firestorm. 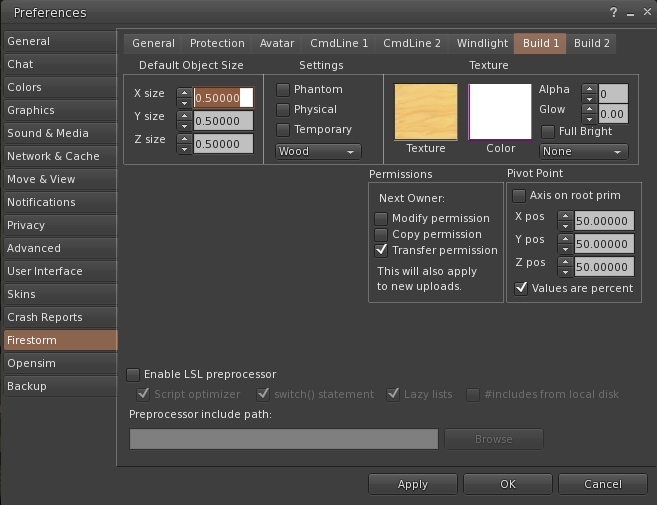 Build 1 (above) contains the options for setting defaults for all newly created prims (size, settings, texture, permissions and pivot point) and the LSL pre-processor options. The Build 2 sub-tab contains the six check-boxes (Save Scripts Edited from Inventory to Mono, Save Textures from Inventory to Disk as PNG Instead of TGA by Default, etc, which had been in the previous Build sub-tab). It also contains four new options. Preview animations on own avatar during upload – when enabled, you can preview animations during the upload process on your own avatar instead of on the avatar dummy in the upload window. 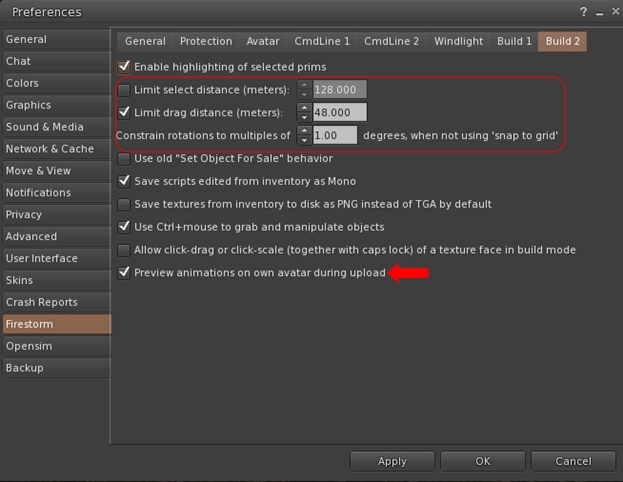 A fix so that when previewing an animation for uploading it (in paused mode), moving the track of the slider will now correctly change the displayed frame of the animation. An option to hear voice equally from everyone, rather than being dependent upon either avatar position or camera placement. 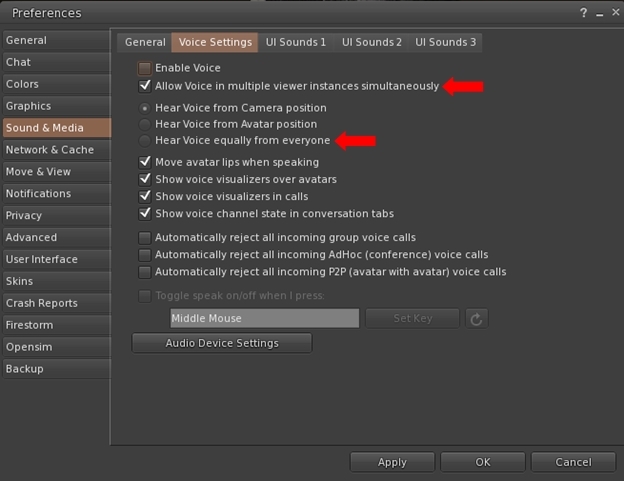 This is a useful addition for meetings, etc., where attendees may be located at difference distances from your avatar / camera position, thus impacting voice quality when they are speaking. A new option has been added to enable the full profile of an avatar to be opened when clicking on an inspect SLurl (Preferences > Firestorm > General > Open Avatar Profile Directly When Clicking on its Name).